Having left Nicaragua 22 years ago it was a huge blessing to be able to go back and see how the church has continued to grow and expand. Most of the churches have one or more church plants that they're working on and many have other ministries as well (Christian private schools, Children at Risk Outreach, social assistance to the poor, etc). After teaching a 'How to Serve in Other Cultures' course in Seminole, Texas (for Berean Schools) I was able to lead a team of 12 students, from 3 diff. participating churches, for a 10 day ministry trip to Nicaragua (Feb 17-28). Highlights included painting and fixing student desks at CIVEM (a private Christian school in Ciudad Sandino), painting and repairs at CINAG (Children at Risk ministry in Diriamba), visiting church services (Morazán, La Paz, Llano Grande, and Las Lajas), and of course meeting the people. 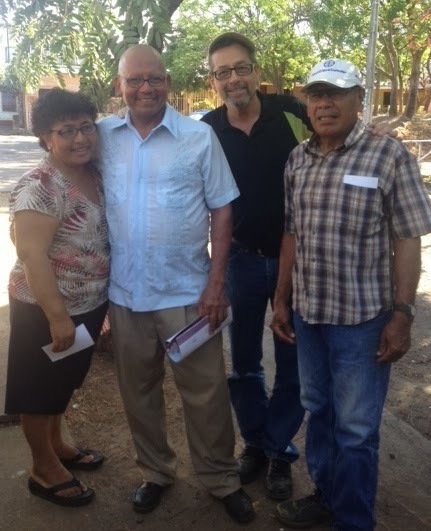 Pictured above are Francisco and Ofelia Cano, pastoral couple in Granada, and Arnulfo Vado, pastor in Santa Teresa. Both of these men were pastors and leaders long before I arrived in Nicaragua in the mid 80's, and have provided significant leadership and stability to the Fraternity of churches in Nicaragua. Another personal blessing for me was our impromptu visit to San José, and Doña Deborah's house. Many of her kids were home and they were going to celebrate her 70th birthday the next day! We were able to sing happy birthday to her, and share a wonderful time together with her and her family. Another pillar in the church. The trip to Llano Grande and Las Lajas had to be the most memorable. It used to be a 3 1/2 hr hike over the mountain into this remote village. Today you can drive (with a 4 x 4) right into Llano Grande. After a service there we did a 2 hr. early morning hike over the mountain and into the next valley - Las Lajas. Another service and back we went to Llano Grande to begin our trip back to Managua. Seeing the steadfast believers here, having youth come forward with special numbers, and hearing their testimonies brought tears of joy to my eyes. These churches are also growing, producing pastors and leaders, and are reaching out to neighbouring valleys. Finally, a word about the 'team'. What a marvellous group to work with! They ate everything... heartily. They worked hard, they embraced the people, they were open to learning, and they were extremely giving. Yes, all in all, this was a tremendous blessing, to our brothers and sisters in Nicaragua, to me personally, and I believe to my fellow team members. Well, I am now finished my Berean involvements for the year and will be focusing on our outreach here in Guadalajara. Diane and I covet your prayers as we strategize, and prayerfully seek to be faithful to the call God has on our lives. Thank you Ernie, for that special report. Hugs and blessings to you and Diane! !